Login Sign Up Like Share Sign Up to see w hat your friends like. Molex has introduced gold-plated Pico-Clasp Wire-to-Board Connectors in single row inner lock vertical and right angle header versions, joining the existing dual-row gold-plated and single-row tin-plated versions. 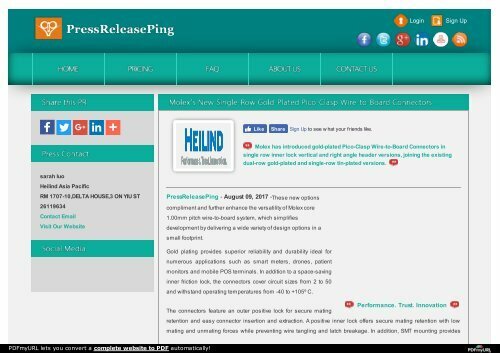 sarah luo Heilind Asia Pacific RM 1707-10,DELTA HOUSE,3 ON YIU ST 26119634 Contact Email Visit Our Website PressReleasePing - August 09, 2017 -These new options compliment and further enhance the versatility of Molex core 1.00mm pitch wire-to-board system, which simplifies development by delivering a wide variety of design options in a small footprint. Gold plating provides superior reliability and durability ideal for numerous applications such as smart meters, drones, patient monitors and mobile POS terminals. In addition to a space-saving inner friction lock, the connectors cover circuit sizes from 2 to 50 and withstand operating temperatures from -40 to +105º C. The connectors feature an outer positive lock for secure mating Performance. Trust. Innovation retention and easy connector insertion and extraction. A positive inner lock offers secure mating retention with low mating and unmating forces while preventing wire tangling and latch breakage. In addition, SMT mounting provides PDFmyURL lets you convert a complete website to PDF automatically!